Posted on November 12, 2016 by Mike Sonnenberg Posted in calendars	. 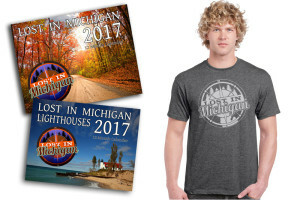 all Lost In Michigan wall calendars, and apparel is ON SALE this weekend with FREE shipping. Calendars are selling out fast, I am not sure when they will be gone, but I am past the point of being able to have more printed by the end of the year. Now is a good time to get one while I still have them available. I made a bunch of shirts, and even some hoodies this past week, and have them in stock. I have a some of each size in stock, I hope you will take a look at them, I even have some dark gray ones too but I only have a few of each size and they can sell out quickly.